This article is the fifth in a series that originally appeared in AN’s July/August 2018 issue which focuses exclusively on Texas and was guest edited by AGENCY. The rest of the essays will be released in the coming days and examine architecture and practice across the southern border of the United States. And it is indeed this figurative floor, this once and future bed of the river where the fight was held, that was both the legal loophole that allowed this spectacle to take place as well as the ongoing challenge to bright-line models of international territoriality. 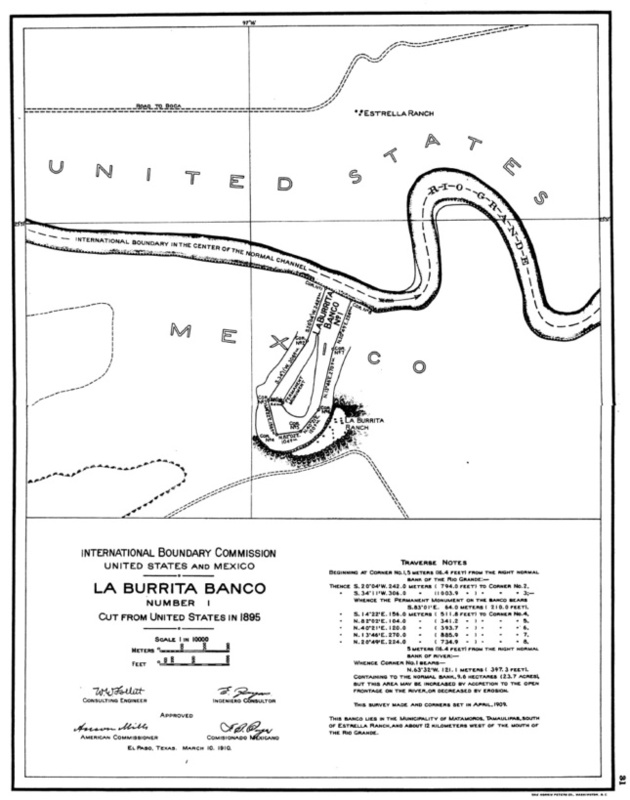 In the contemporary media environment where border walls and military buildup occupy our imagination of the boundary, it is easy to forget that well over half of the length of this border is defined by the fluvial boundary of the Rio Bravo del Norte (Rio Grande). Article V of the 1848 Treaty of Guadalupe Hidalgo reads, “The Boundary line between the two Republics shall commence in the Gulf of Mexico, three leagues from land, opposite the mouth of the Rio Grande…from thence, up the middle of that river, following the deepest channel…to the point where it strikes the Southern Boundary of New Mexico.” Yet, as this and the dozens of subsequent treaties, commissions, and surveys attest, this very definition of the boundary is subject to the fundamentally dynamic and unsettled nature of the Rio Grande River. In general, water law recognizes two categories of boundary change brought about by the changing forces of water: one gradual and slow, the other abrupt and discontinuous. The first, known as accretion, is defined as the gradual and imperceptible deposition of material along the bank of a body of water and the lands formed by this process. Its inverse, reliction, is the gradual uncovering of land caused by the recession of a body of water. In both of these cases, the morphology of ownership maps onto the morphology of the river—with alluvial accretions or relictions belonging to the owners of the coterminous land. The second category, known as avulsion, is defined as the sudden and rapid change of a channel of a boundary stream. Such wholesale shifts in the river channel are quite common in rivers such as the Rio Grande that experience wide fluctuations in flow across the year, where oxbows and meanders are cut off regularly during the spring freshets. In these cases, the changes brought about by such large shifts do not easily map onto adjacent property and ownership structures, resulting in the potential for pockets of alternating ownership—and in the case of the Rio Grande, of citizenship—existing across the river boundary. 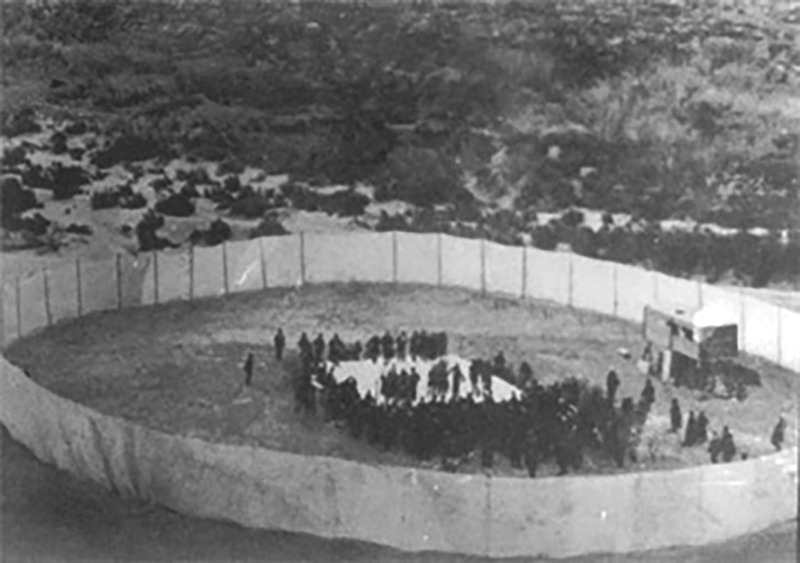 Against Major Emory’s advice, the International Water and Boundary Commission set out in the early 20th century to “rectify”—or straighten—the natural meanders of the Rio Grande in a futile attempt to make the world out there approximate the bright-lines of boundary law. These so-called Banco Conventions, named after the riverbanks cut away by river avulsion, carried the additional political dimension of citizenship: where those who opted to remain on their original land could either preserve title and rights of citizenship of the county to which said banco formerly belonged or acquire the nationality of the country to which the territory would belong in the future. Yet the engineer’s channelization of the Rio Grande could no more make the river act like the surveyor’s line on the plat than it could erase the fundamentally dynamic and relational qualities of being and belonging that mark this border region. Language and law, boundaries and territory, citizenship and rights—these are only a few of the fundamental correspondences that the fluvial geomorphology of the Rio Grande River both narrate and problematize. Jesse Vogler is an artist and architect based in Tbilisi and St. Louis and is an assistant professor of landscape architecture at Washington University in St. Louis.